OLX is the right application for you for selling goods. This application is made for one main purpose, which is to facilitate users throughout Indonesia in fast and quick buying and selling process. There are millions items advertised by millions of users of The All New OLX every day. Find interesting offers and items around you starting now. OLX.co.id previously was Tokobagus.com. At the end of 2014, Berniaga.com formally merged into OLX.co.id. 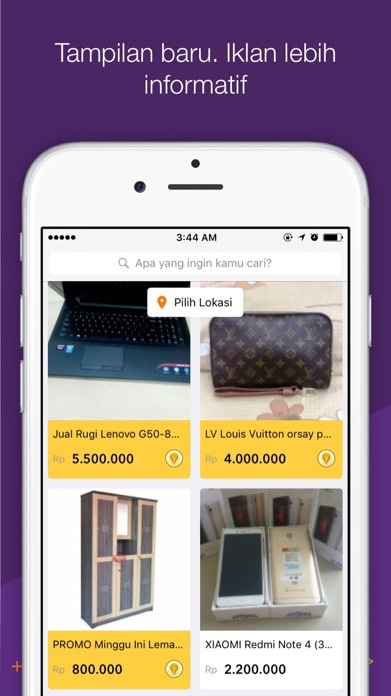 What are the new features of The All New OLX Indonesia? - Advertise concisely. Your ad can be installed in less than 30 seconds. - Let's not confuse the price pairs. OLX will advice you a suitable price for each item you sell. Please uninstall your previous OLX Indonesia app, before installing the newest version.